The article ran in the Baptist press initially on July 7 and was rerun by the Baptist press on July 17. The article itself covered a number of topics including the sunday closure. What I don't get is how does this . 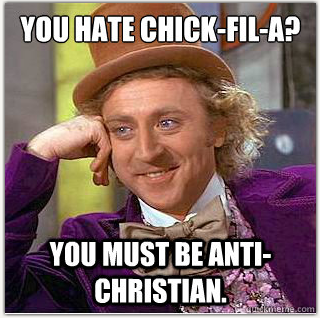 . .
get interpreted as "Chick-Fil-A hates gays" or "Chick-Fil-A is anti-gay"? Using the same logic . . . well, I'll just let Wonka speak for me. Mostly all this Chick-fil-a love/hate made me want some chicken, especially the kind Chick-fil-a provides. I'll be glad when/if this stuff dies down.